If you want to do it the easy way, you can upload a picture online and have a real puzzle printed for you (This could be a fun date night). Walgreens.com sells an 8x10 puzzle (110 pieces) for $14.99. Now, in keeping with my romance ideas on a budget... I recommend these ideas that cost $1.00 or less! Buy a large posterboard (the thin paper style) that you can write, paint, etc. your message on, then cut out into your own puzzle pieces. Hide each piece around the house (in semi-obvious places) for him to find and then put together. You’re the missing piece to my puzzle. I love you to pieces. You keep me together. You keep me from falling to pieces. 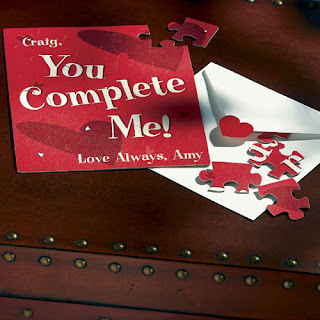 We fit together…you’re my missing piece! Painted it with acrylic paint and wrote on it with permanent marker. Thanks for leaving a comment on my blog a few days ago. I think I might try this this weekend!! Such a great idea you are soo creative! I definitely need to add a little romance. I love this idea! Another sweet way to say that special something! Thank you SO very much for stopping by and leaving a sweet comment on my blog the other day!!! It meant so much to both me and the 'birthday man', Erik! That is a GENIUS idea!! And would also be a great Father's Day gift for the kids to do themselves. Thanks for the idea! !